[PDF] Silicon Earth: Introduction to Microelectronics and Nanotechnology, Second Edition | Free eBooks Download - EBOOKEE! Description: We are in the center of the most life-changing technological revolution the Earth has ever known. In little more than 65 years, an eye-blink in human history, a single technological invention has launched the proverbial thousand ships, producing the most sweeping and pervasive set of changes ever to wash over humankind changes that are reshaping the very core of human existence, on a global scale, at a relentlessly accelerating pace. And we are just at the very beginning. 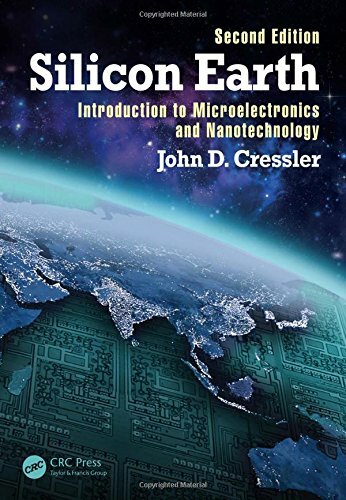 Silicon Earth: Introduction to Microelectronics and Nanotechnology introduces readers with little or no technical background to the marvels of microelectronics and nanotechnology, using straightforward language, an intuitive approach, minimal math, and lots of pictures. The general scientific and engineering underpinnings of microelectronics and nanotechnology are described, as well as how this new technological revolution is transforming a broad array of interdisciplinary fields, and civilization as a whole. Special "widget deconstruction" chapters address the inner workings of ubiquitous micro/nano-enabled pieces of technology, such as smartphones, flash drives, and digital cameras. Completely updated and upgraded to full color, the Second Edition: Includes new material on the design of electronic systems, the future of electronics, and the societal impact of micro/nanotechnology Provides new widget deconstructions of cutting-edge tech gadgets like the GPS-enabled smartwatch Adds end-of-chapter study questions and hundreds of new color photos Silicon Earth: Introduction to Microelectronics and Nanotechnology, Second Edition is a pick-up-and-read-cover-to-cover book for those curious about the micro/nanoworld, as well as a classroom-tested, student-and-professor-approved text ideal for an undergraduate-level university course. Lecture slides, homework examples, a deconstruction project, and discussion threads are available via an author-maintained website. No comments for "[PDF] Silicon Earth: Introduction to Microelectronics and Nanotechnology, Second Edition".